This is a story about a 4 year old boy named Lowell. 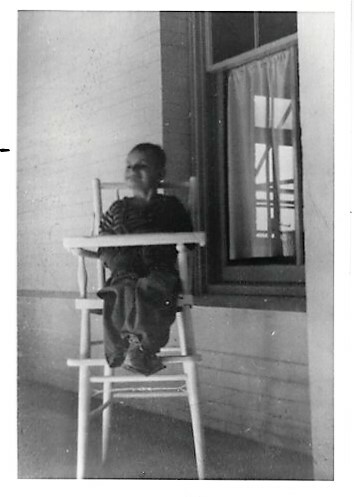 Lowell was born with mental and physical disabilities, the 5th child among 8 siblings. When he was four his parents were told that Lowell could no longer be raised at home and would have to go to a state supported school for children like him. This was a common practice during that era. They had no choice. Within days a man came to take Lowell away. The man placed Lowell in the back seat of his car and drove away. I have often wondered what it was like for that little boy to be driven several hours away…never to see his family again. The state institution recommended no visitation as it would only remind him of his family. Lowell spent his entire life in that institution. There were national reports of how badly people were treated there and some procedures were forced to change as a result. I was 10 days old when my brother Lowell was taken away. The only time I saw him was at his funeral 26 years later. I had just returned from the Army and notified the institution that I was coming to see my brother. He died before I got there in the Spring of 1969. I tell this story because it defines me. As a young boy in school I was quick to defend those who were picked on… sometimes standing up to bullies on their behalf. It’s what led me to be a police officer and a quest to serve and assist those who needed help the most. Returning from the Army to my job at Collins Radio my fellow employees asked to be their union steward and stand up for their rights. I did so turning many confrontations with management to win/win outcomes before I left to join the Cedar Rapids Police Department. As a new officer I saw some inequities but there was only a city grievance process that most employees were afraid to use. I was not and I took a case through the process and won my grievance. Other employees asked me to help them and I did, and they won. I even received a letter of commendation from the Chief of Police. As a department director within the state I fought the state bureaucracy year after year and refused to layoff my employees. I am proud to say I am the only state director that served 24 years without laying off a union employee. Throughout my career I have worked to bring peace to those affected by injustice, oppression, violence, prejudices, and hatred. It’s why one of my platforms is Advancing Justice and Human Dignity (I guess I feel like I am fighting for Lowell). We are all the same, worthy of respect and granted dignity by all. In Cedar Rapids we do not need to have winners and losers. We will not lose privilege or status to help others along the way as we continue to rebuild this community. Hence I offer my goal of Continued Community Development. We will gain status if we help others escape fear and want. We will be a better city for all our efforts. We can build beautiful structures out of steel and concrete, but a stronger and more beautiful community by working together and showing compassion for one another. The historic flood of 2008 taught us that we are all in this together and we must work together for a better collective future. We need to continue to work for the dignity and security of all. Our business leaders, our neighborhood & community leaders, and our government leaders need to work in unity to find ways to make Cedar Rapids better and safer for all.